It’s that time of the year when the Ottawa 67’s will play in front of their loudest and most boisterous fans – the students! The 67’s play their annual School Day Game on Wednesday morning against the Kingston Frontenacs at the Canadian Tire Centre. This will be ninth consecutive year that the 67’s will be hosting their School Day Game and with a near capacity crowd expected to turn up for this annual event, it will be one of the most energetic and electric atmospheres that the Barber Poles will get to experience. While the students look forward to this event, it’s also a day on the calendar that the players eagerly await. Not only do they get to play in front of kids vociferously yelling out their support and feed off that positive energy bouncing in the seats but it’s also that great chance to play in the Senators rink – which for many will feel like that extra inch closer to their NHL dreams. On the ice, the 67’s will be looking to kick start November with a win. 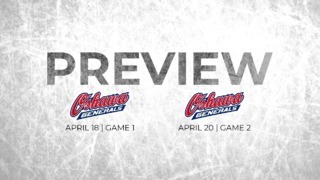 They’re coming off a narrow 4-3 loss against the Oshawa Generals but they have had a strong run in October. The 7-4-0-0 run this past month saw them register their biggest win this season when they thrashed the Saginaw Spirit 11-3 on Saturday afternoon. 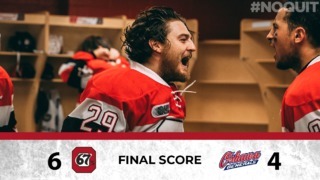 This win also extended 67’s winning streak at home to five games, remaining unbeaten at TD Place this season (5-0-0). They have also been overtime specialists so far this season, winning six out of seven contests. While the 67’s have had a good month, their opponents would like to forget October in a hurry. The Frontenacs ended up with a disappointing 3-4-1-2 run this past month. They started October with back-to-back wins but then went on a seven-game losing streak. It was only in their last game that they were able to arrest that downward slide when they defeated Saginaw Spirit 3-2 in overtime. 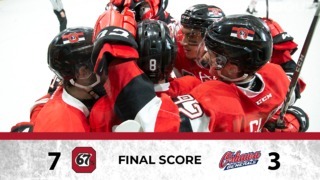 The 67’s have won three out of the last five games played against the Frontenacs and will be looking forward to maintaining that positive record. After the School Day Game, the 67’s will return to TD Place on Friday at 7pm against the Barrie Colts where they will honour one of their greatest alumni – Brian Campbell. Campbell will see his No. 44 retired prior to the game against the Colts. Sasha Chmelevski is in red-hot form, having scored four goals in the last two games. He, along with Tye Felhaber, lead the 67’s in points with 14 apiece. With a Power Play conversion rate of 17.6%, the 67’s are ninth in the OHL. At home this increases to 19.4% and the 67’s move one place up in the standings. With an 82.8% penalty kill success rate, the 67’s are 10th in the OHL.